If you missed Ganja White Night’s two sets during Buku Fest in March, the Belgian producer duo will wub their way back to New Orleans this Memorial Day weekend. En route to a weekend of festival appearances, Ganja White Night headlines Republic NOLA on Friday, May 26th alongside opening acts Bleep Bloop and Pleasure. 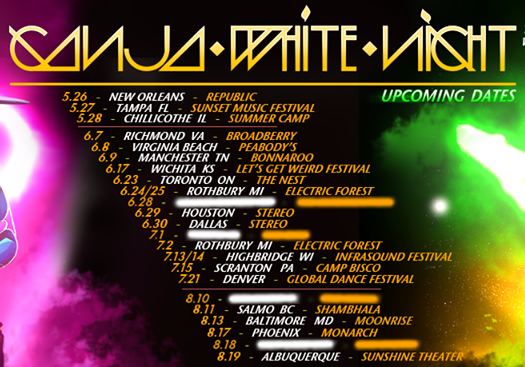 Ganja White Night currently find themselves in the midst of a 25-date North American tour, partially in support of their latest album, Mr. Wobble (2016). If you’ve enjoyed this dubstep combo’s hard-hitting bass tracks since the beginning, their new album didn’t disappoint. Over the past several years, Ganja White Night embarked on a roundabout exploration of what does and doesn’t work for their specific breed of intelligent and technically-complex bass-driven originals. The wisdom, creativity, technical prowess and maturity they harnessed while on that global adventure especially shines through in tracks like “Bass Ripples” and “Wobble Master.” The latter even enjoyed a VIP release on All Good Records last October. The progression Ganja White Night has followed from their self-titled debut (2010) to Mr. Wobble is contextualized most clearly by Hybrid Distillery (2015) and Addiction (2014). Out of Ganja White Night’s six albums and an EP, these two stand as the duo’s strongest efforts toward breakout experimentation and genre fusion. That eager exploration of bass music and other genres ultimately guided their continued evolution to Mr. Wobble and beyond. As their technical abilities improved and their understanding of electro-acoustic music deepened, Ganja White Night released tracks that featured more exotic and complex instrumental and vocal samples. But while keeping one foot firmly placed in their bass music foundation, the pair’s collaborations also took on new shapes, colors, and movement. Dabbling in downtempo, ambient and hip-hop genres alongside the dubstep bangers they were known for ultimately led to their success today and their most recent recording effort. Ganja White Night’s Republic set continues a summer brimming with festival appearances for the group. After already blowing away crowds at Okeechobee Music & Arts Festival, the pair’s fest trek continues with Sunset and Summer Camp this weekend, and then the list goes on: Bonnaroo, Let’s Get Weird, Electric Forest (both weekends), Camp Bisco, Global Dance Festival and Shambhala, to name a few. Priming the stage for Ganja White Night will be Bleep Bloop’s space bass odyssey—a healthily-balanced set of dark melodies and belligerent bass drops sure to include popular collaborations like “Phalanges” (G Jones) or “10 Watt Lazers” (Liquid Amber). But first, Brooklyn’s own Pleasure (and Bleep Bloop’s Saturate Records labelmate) launches the late-night revelry, following an earlier evening set from The Mountain Goats. Start your Memorial Day weekend on a high note—and deep throbbing bass beats—at Republic NOLA’s double-header this Friday night. RSVP & Get Tickets here.